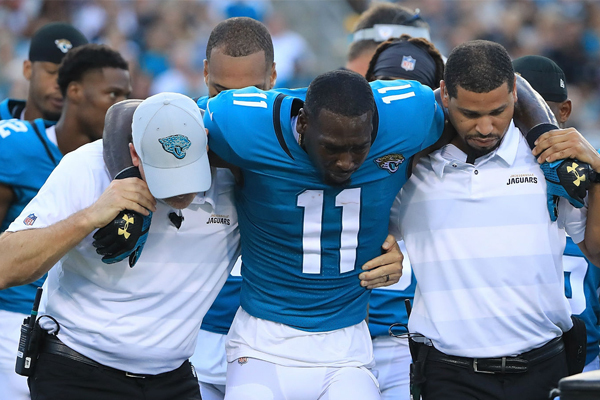 “Marqise Lee suffered a knee injury and will have surgery. Later today he will be placed on IR,” Marrone said Monday. Lee was injured Saturday against the Falcons after catching a 20-yard pass and getting hit low by safety Damontae Kazee. Kazee made contact with Lee’s left knee, causing it to bend at an awkward angle. Jaguars corner Jalen Ramsey placed blame for the hit on the NFL’s new tackling policy, which penalizes players lowering their helmets to make hits. The news is a blow to the Jaguars, who re-signed Lee this offseason for $10 million with $7.25 million fully guaranteed for 2019. Marqise generated 702 yards and three touchdowns on 56 receptions in 14 regular-season games in 2017.